Today's wine came from Garagiste and set me back $16.83. I wonder how he comes up with his pricing - there seems to be no rhyme or reason to the last two digits. Maybe it's some sort of secret code. Overall it had a nice purple color but was a bit light around the edges. Initially I sensed soy sauce and worcestershire sauce on the nose. The palate was like molasses that you find in barbecue sauce, mixed with berries. After gaining more air it morphed into tartish cranberry tastes. The wine had an acidic bite to it along with minerally tannins. The aftertaste trailed off rather quickly. I don't drink enough wines to say this from experience, but only from what I've read about the 2004 Rhone area vintage - this wine appears to reflect the nature of that vintage. 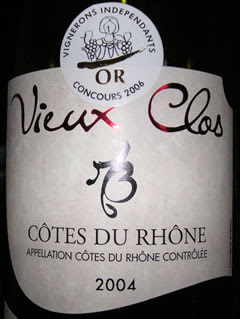 The fruit was restrained rather than ripe or rich, and the acidity made itself known. It seems one to drink with food. This one gets sideways thumbs. It tasted natural and there's nothng wrong with it, but it's not something to get excited about, either. Here's a tartish YouTube video to go with the tartish, acidic character of the wine. Click here if you don't see it below.